Shimmering shorelines, swaying palm trees, powder-white sands… what picture do you conjure up when you're deep in holiday daydreams? There's no rules when it comes to the perfect exotic holiday – it's each to their own. Whether you're after encounters with ancient cultures or luscious landscapes bursting with natural beauty, let us tempt you with these tropical treasures. From beachside beauties to mountain majesty, embrace your inner explorer and escape on one of our exotic holidays. Paradise-hunters never need look any further than the hallowed shores of sensational St. Lucia. Every bit as effortlessly exotic as you might imagine, Mother Nature has been kind to this Caribbean gem. Nature takes centre stage with a premier performance from the iconic peaks of the Pitons. The undisputed crowning glory of the south west, the pair sit proudly over the little fishing town of Soufrière. Visible from almost anywhere on the island, there's even a local beer named after them! Unspoilt rainforest carpets the island, bursting with fragrant flowers and tropical plant life. 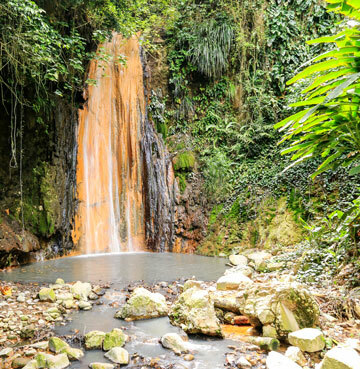 Stroll through the botanical gardens and stop by the stunning Diamond Falls. The soulful sounds of the rushing water, tropical bird song and rustling palms make this serene sanctuary all the more tranquil. The breathtaking nature display doesn't stop there! A multi-coloured coral world awaits below the waterline, teeming with countless species of fish. Divers travel far and wide to experience the wild beauty beneath the waves. 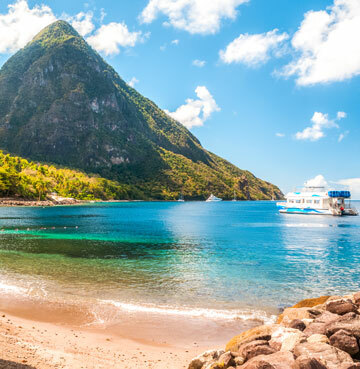 The world of outdoor activities is your oyster on St. Lucia. Tackle one of the most popular treks to the top of Gros Piton and conquer the UNESCO World Heritage Site for yourself. Jaw-dropping vistas await for those who brave the climb, with pinch-me pretty panoramas from every angle. Whatever you do, make sure you carry your camera – this is an eye feast that the lens will eat up. Plus it's always good to have photographic evidence of your mammoth accomplishment. Once back down, head to Jalouise Beach for sole soothing waters and a well-earned rest. A flurry of festivals with flamboyant costumes, easy-going entertainment and mouth-watering food encapsulates the captivating St. Lucian culture to a T. From religious holidays to cultural events, any excuse goes when it comes to celebrating the island's heritage and lifestyle. And this is a party you don't want to miss! As luck would have it, festivals pop up year-round, so dust off your dancing shoes and give your taste buds a tang of the exotic. Get ready for carnivals, music festivals and rum cocktails galore. As far as unforgettable experiences go, the novelty of a drive-in volcano isn't one that quickly wears off. Visitors are invited to bathe in the sulphur springs and mellow out in the mud baths. Plus the natural properties are alleged to do wonders for sun burn and skin tightening. Who knows? You may fly home looking ten years younger! Even if you don't, plastering yourself in mud is a memorable holiday highlight. For those travellers with a sweet tooth, St. Lucia's got you covered. Walk through cocoa plantations, learn how to make your own chocolate bar, indulge in tasting tours and even experience chocolate-infused spa treatments! 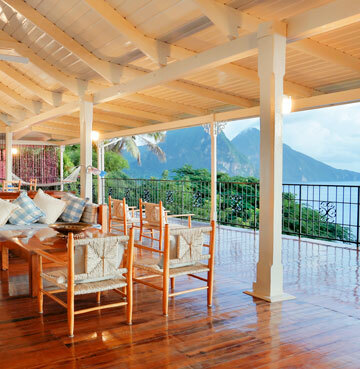 Where to stay: Villa Calypso in Soufrière. One of the most coveted locations on the entire island, this perfectly perched home from home sits pretty above the popular Anse Chastanet Beach. Calypso boasts unbeatable views across the Caribbean Sea to the famous Pitons, making a stay here an extra-special exotic extravaganza. You can't get more exotic than outer space, and Lanzarote's unique shores look more like Mars than Earth! Packed with personality from coast to coast, its cinematic panoramas and out of this world landscapes are a 'have to see it to believe it' experience. Bursting with natural beauty across the board, it's a fully-fledged paradise for adventure seekers. Trekking, exploring and outdooring are all on the agenda and thanks to year-round sunshine, there's not really a bad time to get moving! Beaches in Lanzarote are almost as plentiful as grains of sand. All unique in their own way, you're sure to find one that tickles your fancy. Long stretches of golden sands lapped by calm waters, secret coves set against craggy cliffs or wild waters whipped by Atlantic waves for surfing. 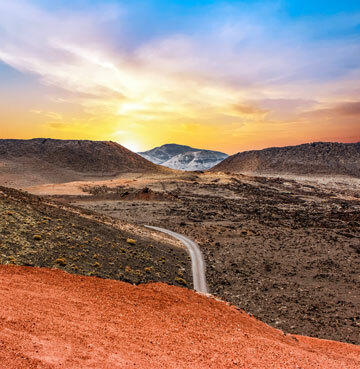 You name it – Lanzarote's got it! Timanfaya National Park's lunar landscapes are a treasure trove of diversity and obscurity. Volcanic playgrounds of lava fields are set against red and black desert Badlands, making for an unbeatable day out. Although you won't be able to set out on your own, narrow roads snake through spectacular scenery and coaches lay in waiting to transport you from one wonder to the next. For a more unorthodox mode of transport, opt for a camel safari and see the sights from the back of one of these beautiful beasts. Taking the journey underground, there's just as much raw beauty beneath the surface as above. The jaw-dropping Cuevas de los Verdes are a labyrinth of caves that were once a hiding place from pirates! One of the largest volcanic tunnels in the world, dramatic lighting emphasises the textures and structures of the caves beautifully. Another must-see is Jardín de Cactus (the Cactus Garden). Chock-a-block with cacti from the world over, it's home to 10,000 plants and 1,400 different species. 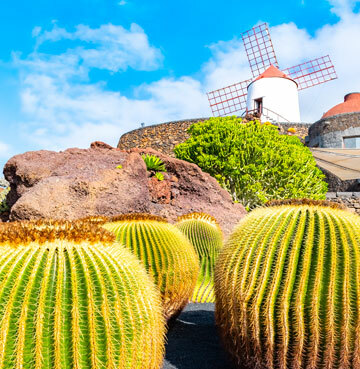 Dreamt up by Lanzarote's most famous resident – César Manrique – it's just as unique as the island it's found on. A true celebration of the beautiful botanicals, your instragram feed will thank you for taking a snap or two. Cycling and sightseeing go together like hand and glove in Lanzarote. There's plenty of routes island-wide, from relaxing flat trails to sweat breaking mountain climbs. One of our favourite family-friendly trips starts in Arrieta and takes you to Orzola. A gentle track leads you through stunning scenery and brings you to a quaint little village fringed with beautiful beaches. Where to stay: Villa Valentine in Playa Blanca. Ideally situated within walking distance of the beach and Rubicon Marina, there's plenty of choice when it comes to grabbing a bite to eat. Just a 15km journey to Timanfaya National Park – Lanzarote's best bits are just a stone's throw away. 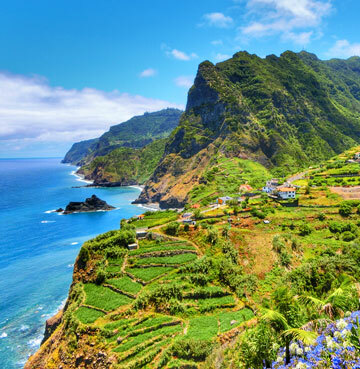 Striking and sub-tropical, the magnificence of Madeira is nothing short of magic. One of the most unique islands in Europe, you'd be forgiven for confusing the mesmerising marvel with the likes of Malaysia or Hawaii. Except this bad boy is a short four hour flight away from the UK and exotic without the eight hour plane ride. Wonderfully wild and elemental, prepare to marvel at Mother Nature's handiwork. Lush with waterfalls, lagoons and dramatic cliffs, exotic is extraordinary here. Seamlessly mixing relaxation and adrenaline fuelled adventure, you can most definitely have your (Madeira) cake and eat it. Climb through the clouds and ponder the paradisiacal panoramas as you make your way from peak to peak. A classic choice for many visitors is the Vereda de Areeiro, which connects two of the highest points on the island and is often hailed as one of the most impressive hikes around. Once you've come down from cloud nine, Verada das 25 Fontes is a welcome walk alongside the iconic levadas, nestled in the interior of the island. Besides the 25 springs, you'll get a front row pass to rugged Risco waterfall. And if you enjoy chasing waterfalls, Madeira is the place to be! Of course, if you're not into breaking a sweat, some of the peaks offer viewing points that you're able to drive to. For those who find hiking anything but relaxing, cheat your way to beautiful panoramas with Madeira's captivating cable cars. You'll enjoy unmissable bird's eye views from unique vantage points, not to mention arriving a little more carefree and a little less sweaty. One of the most famous rides glides you over the rooftops of fabulous Funchal to the hilltop perched parish of Monte. Drink in the jaw-dropping sights over the capital's bay and soak up the peaceful environment before exploring The Municipal Gardens. 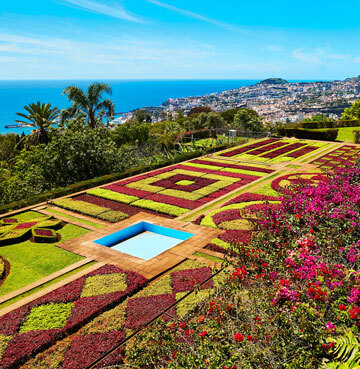 Covering much of the parish, expect to find over 100,000 exotic flowers, ancient trees, oriental gardens and verdant views. If you're after an even bigger floral fix, hop in the next cable car and keep making your way up the cliff. For the return journey, don't miss the opportunity to ride in one of the iconic wicker toboggans! Nature lovers are well and truly spoilt by Madeira's wonderful wildlife. 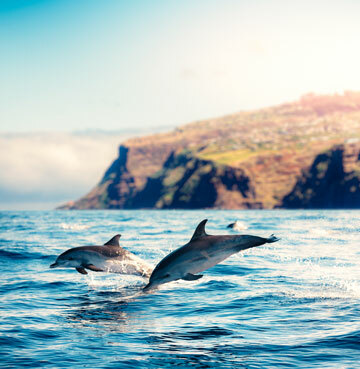 Whale and dolphin watching is one of the most popular pastimes for visitors trying to get a sneak peek of an unbelievable water world. Choose between an adrenaline pumping speedboat or calming catamaran cruise and get up close and personal with these amazing creatures. Pilot and Sperm whales can be seen year-round, while other species like Humpback and Minke whales come and go. If you're really lucky you might even spy Orcas! Bottlenose dolphins are common in the area too. These playful porpoise love nothing more than showing off for their awestruck audiences. So be sure to spark your wanderlust with some bona fide wildlife watching and pack a waterproof camera for some splash-tastic shots! Where to stay: Villa Mirage in Calheta. Found in a beautiful coastal resort with the island's only golden sandy beach, this is the perfect setting to blend leisure and pleasure. Mix eats and treats at the memorable marina, with heavenly hikes courtesy of the nearby levadas.